In the Halifax, Nova Scotia suburb of Waverly, Miles Goodwyn was playing in a group called Woody's Termites. His next door neighbor, Jimmy Henman convinced him to join a group composed of himself and his cousins, Ritchie and David Henman. Jimmy and Goodwyn had previously played together in several bands including East Gate Sanctuary while David and Ritchie played in the Lower Sackville group, Prism (not to be confused with the famous Vancouver group of the same name). The name April Wine was coined by David for no apparent reason. During the recording of the first album, big changes were developing as vocalist/bassist Jimmy Henman suddenly returned to college, leaving Goodwyn to lead the band both musically and vocally. Jim Clench was brought in to fill Henman's shoes on bass. Goodwyn and Clench soon became allies for a shift in musical direction and internal struggles with the Henmans led to the brothers leaving the act to form Montreal-based band Silver and, later, The Dudes with Bob Segarini. Veteran Mashmakhan drummer Jerry Mercer was added after a stint with Roy Buchanan and guitarist Gary Moffet came from Pops Merrily. Typical artistic differences splintered the group and despite Clench's significant vocal and writing contributions, he left to join BTO for several albums and tours. Steve Lang (The Cheeque, Devotion, Mashmakhan) was his replacement. As part of a drive to make April Wine tougher sounding, guitarist Brian Greenway, also of Cheeque, Mashmakhan and The Dudes was summoned by his old bandmates to quit his forklift job and join April Wine for the 'First Glance' LP. 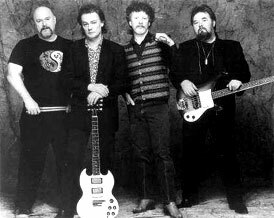 All along the way April Wine became an institutional Canadian stadium rock act with Top-40 hit after Top-40 hit. After their successive run, the industry began shifting with techno-pop of the '80's and April Wine found themselves a hard rock act with a dwindling audience. Their farewell tour was in 1984 for the 'Animal Grace' album and it was successful enough to spawn another in a long line of live albums. Goodwyn put April Wine to bed for a long rest with an eye to working on a solo career. However, April Wine still contractually owed Capitol Records one more album. Greenway joined Goodwyn in Nassau, along with Montreal session musicians Barbe, Pellerin and Simon, to record what was supposed to be the band's final album - 'Walking Through Fire'. While living in the Caribbean, Goodwyn released a solo album to middling reviews and zero sales. Soon, a serious discussion to revive April Wine followed. Goodwyn returned to Montreal in preparation for the recording of a second solo album, but interest was steamrolling for an April Wine reunion. Greenway, also licking the wounds of an aborted solo career is the first to sign on. Mercer leaves The Buzz Band and also returns but Moffet is fully committed to his production company and his spot is filled by local guitarist Steve Segal. After years away from April Wine, Jim Clench returned from Calgary to Montreal to fill in the bass slot. The band would sign a new record deal with FRE Entertainment and released two albums of mostly new compositions - 'Attitude' (1993) and 'Frigate' (1994). April Wine still packs 'em in as a 4 piece (Segal was let go as a cost saving measure) and they play 100's of shows yearly including the annual Classic Rock Festival in Minidosa, Manitoba. There have been rumours of a new studio album over the last few years and possibly a live album. Noteable Entertainment & Events is a Vancouver based booking agency, party rental, entertainment services and event production company. If you are interested in booking April Wine please contact us.